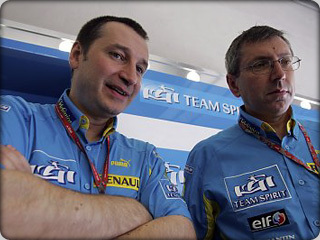 The photo above of Rob White, on the left, and Dennis Chevrier appeared in the Formula One section of speedtv.com on September 14, 2006. Adam Cooper questioned Rob, ex-Cosworth now Engine Technical Director at Renault F1, on the details of Fernando Alanso's engine failure late in the race at Monza. Adam Cooper: What are your first thoughts on the failure? Q: We know drivers have extra revs to use from time to time during the race. Bearing in mind he had to come through the field, had he used up his allocation? After I saw this piece I took a look at the interview I did with Rob more than a decade ago and decided it's still interesting. Today engine developers probably use more simulation software but I'll bet most power gains still come from clever improvements and running engines until they break. This interview appeared in the Engine Chapter of Inside Racing Technology published in 1995. I still have a few copies left. If you'd like to have one send me an email using the link above in the left column. This is a very long interview but worth your time. I visited Cosworth's Southern California facility several times in the early 1990s. This is where they assembled engines for the CART IndyCar series and I assume they now put engines together for the current Champ Car teams. In October 1993 I went again for an interview with Rob White who was the CART Track Support Manager. At that time I was traveling to most of the CART races writing articles for my newsletter, TV Motorsports and compiling material for my first book, Inside Racing Technology. Racing technical people aren't always forthcoming when questions are asked. Rob was and, I assume still very helpful when asked a serious question. He knows what he's doing well enough that he can provide useful information without divulging proprietary stuff. As I do before all my interviews I spent some time thinking about what questions to ask and came up with the ones below. I faxed them to Rob about a week before the trip. 1. Background, personal and professional. 2. Are developmental increases in power planned or serendipitous? 3. What are the sources of power increases? Mechanical improvements vs. software? 4. What are the trends in materials? Flame or plasma spray? Chemical vapor deposition? 5. How are fuel mileage gains being made? 6. What do multiple injection nozzles accomplish? 7. What are the current limiting factors? Flame travel? Component fatigue strength? 8. What is the weak component at max rpm? 9. Piston trends. Materials? Ringless? 10. What changes are made to engines to maximize performance at different tracks? Fuel and ignition maps? Mechanical parts? 11. Do you have simulation capabilities that work? Design? Dyno? 12. If you have the opportunity to influence chassis design, what do you try to do? 13. What are the trade-offs on pneumatic valve control? Is rising pressure a better choice than constant pressure? 14. Trends in overall packaging? 15. Most difficult/critical component to design/develop? 16. What do you do at a racetrack on race weekends? Technical support? Sympathetic ear? Customer communications? When I arrived at the Cosworth shop in Torrance I was greeted by Ian Bisco, the guy who ran the facility, and he and I sat down for a talk about general Indy car/Cosworth stuff. Later we found Rob and he took me into an office to talk. We sat down across from each other at a desk, and I set up my tape recorder. Rob had prepared for the talk by reading the questions I sent and making some notes. He referred to the questions and his notes throughout the talk. Rob White is a very likable, university-educated professional engineer in his thirties. Seen in an Indy car pit, Rob seems intensely focused and a little stiff, but when he talks one-on-one his eyes sparkle with enthusiasm and small smiles come and go. Rob has that charmingly-British, disarming, almost-shy, self depreciation that compliments his technical strength and helps him perform what is a very, very difficult task, dealing with Indy car owners, crew chiefs, and mechanics. They expect a lot from a Cosworth engine. After I got set up, Rob looked up from my question list, grinned and started to talk. RW: "I anticipated most of your questions, but not the first one [laughs]. The one about how I came to be doing this. It started a long time ago. When I was in school I used to race karts and tinker about with Formula Ford engines in my spare time. When I left school I worked at Jaguar Cars in Coventry, England, and as a result of that they sponsored me to go to University, and I did a bachelor's degree in meechanical Engineering. But as soon as I got my degree I up and left to work for Cosworth. I've worked for Cosworth since 1987, and most of my time at Cosworth I've worked on the Indy car engine. In the early days I worked for Steve Miller, then the chief engineer. It was essentially just the two of us engineering the DFX, which would grow into the DFS. At one point we decided we needed to do another engine, and right from the beginning of the XB engine project I've been in there in the thick of it. After the XB was laid out, designed, and detailed, then I was working directly for Steve and responsible for the performance development of the engine. At the beginning of 1993 I came to Torrance to look after the servicing of the engine and take care of the mechanical spec of the engine as built at Torrance, which is a satellite plant. All the parts of the engine are designed and built in England and serviced in Torrance." PH: "Where did you go to school?" RW: "The University of Southampton." PH: "Was that a theoretical program? Did you get any manufacturing exposure there?" RW: "There was quite a bit of manufacturing content in my degree courses, but in truth, nothing we could do at school could compare with the practical experience you get when you're doing things for money [laughs]. I learned a lot about that building automobiles at Jaguar, and then, of course, one of Cosworth's greatest strengths is its manufacturing. Even to this day, every time you go into the machine shop you've got to be dumb not to learn something. The place is still very close-knit, and you're perpetually in contact with manufacturing people throughout your working life at Cosworth. The manufacturing process and the discipline it takes is crucial to making this whole thing work. We couldn't work without it." PH: "Were you a car nut?" RW: "No, not really. I've never been a car nut. I'm a working mechanisms sort of person. If you can take something apart and put it back together and take out some of the clutter inside, it wouldn't really matter if it was on a car or a boat or an airplane bit. I'm still not particularly interested in street cars. Engines always fascinated me; anything mechanical, clever gizmos and stuff like that." RW: [starting on the list of questions] "Are development increases in power planned or serendipitous? Bit of both I guess is the answer. About 50-50 [grins]. In the development stage of an engine you have to sort of organize your life. What happens, I suppose, is you plan to go looking for some performance and sometimes you find it and can put a tick in the box and say that was a planned increase. Other times you don't find what you're looking for. I guess it's important to be aware that even if every time you make a change or do an experiment you don't find a big lump of bolt-on power, oftentimes some learning takes place along the way which you can sort of pigeonhole away for next time. Undoubtedly though, there are times when you just get a lucky break, and you stumble over something or you go looking for something and it points the way to something that you haven't anticipated. Probably the best examples of those you can't really talk about, but there have been one or two of them. "In general, to try and dispel the mysticism that there is out there, most of the performance that you get out of an engine after you move from putting the pieces together for a new design is just a matter of continual optimization, and it comes down to the age-old thing that people have known about engines for probably 80 years ,which is if you want to make more power, you've got to get it to swallow more air, make it breathe better, and run more quickly. So you're into moving closer to mechanical barriers which always exist, or you try to move the mechanical barriers a little bit further away from where you are at the time by making some changes. Everything that we do in the way of performance development is focused on these two areas. Sometimes you find that you're machining big pieces to make a change to make it breathe better, and sometimes you're doing what appears to be infinitesimally small work with, for example, ports or valves or valve seats on a flow bench. Sometimes you're working in thousands of an inch and other times you find yourself sawing a couple of inches off a piece of steel pipe. "Our goals are similar throughout all that though, and we're always trying to make it use more air. That's because air is the working medium for a reciprocating engine, and it's the stuff that you don't have direct control over. You have direct control over the amount of fuel that you put in and you can basically put in as much fuel as you like. You have to pace that to the amount of air that the engine will swallow. So, when we go to the development phase of an engine, we go after making it swallow more air first off. Then fuel it accordingly. "The other big path that you follow is reducing mechanical losses. The real big lumps of that come about when you redesign your engine. Most of the mechanical losses that we're fighting against are defined by the architecture of the engine, the layout of the pieces, and based on the base dimensions that you choose for the major components, and so are pretty much cast in concrete as you move into the development phase of the engine. "There are little things that you can do, and because it's a game of optimization, there's some stuff you can do once you've put your first engine together, things like scavenge pumps. There's a balance between the power consumed in driving these pumps and the power saved by running the crankcase in depression [low pressure], and by completely evacuating the oil from the engine. So you have to balance the two, and somewhere in between there's an optimum speed for the scavenge pumps to run relative to the engine speed." PH: "When you're designing an engine, what do you work with? Paper, computer, CAD [computer-aided design]?" RW: "It's a mixture at Cosworth. It's still a very small group of people who actually do the layout of a new engine. For the Indy car engine right now that's Steve Miller, chief engineer; Stewart Groves actually designed the XB engine, but he no longer works for Cosworth. He works at Ferrari. "The major items are the cylinder heads, block, sump, crank, rods, pistons, and then the cam drive mechanism. The pumps aren't trivial, but they're a packaging exercise most of the time. This is one of the benefits that a company like Cosworth has in that there is a lot of prior knowledge, a lot of information available from previous designs, and, although it's important to assess what you're doing each time you make a new engine, it's equally important to make use of what's available to you from previous times. There are some things which take place in the pumps that make such good sense and get modified only after a lot of soul-searching, and, as a consequence, the auxiliaries themselves give us, typically, [knocks wood, grins] very little trouble. I guess that the cylinder head is the biggest piece in an engine. That's the piece that you tend to guard most jealously. "Going on down the list, then?" RW: "Usual sources of power increases, mechanical or software? Almost all are mechanical improvement and very little software. In terms of raw horsepower there's almost nothing you can do electronically or in software to improve the performance of the engine." PH: "So software has mainly improved the drivability and flexibility?" RW: "Yeah, and also the thing that's often overlooked in the favor of the electronic stuff on the engine, is the facility it gives you to do mechanical work so easily. Inevitably, when you want to make a mechanical change, you have to make a change to re-optimize fueling, ignition, or injector timing, and, with electronics, you just twiddle a knob or edit a table and you're there. Whereas, in the old days, if you wanted to change the ignition timing, then somebody had to go in there while the engine was running and crank a trigger backwards or forwards or, before that even, crank the distributor backwards or forwards. If you wanted to change the fueling of an engine while it was running, with carburetors, you had to be hauling around choke tubes and emulsion jets and other little pieces of the carburetor. More recently than that and probably even more ghastly, you had to tinker with cams and springs and orifices and restrictors and such things in mechanical fuel injection metering units, all of which would distract you from what you're trying to do, which is investigate a mechanical change." PH: "Now all that is just a huge waste of time that you don't have to worry about anymore." RW: "Sure. The electronics greatly increases the amount of mechanical work you can do but, on their own, they're unlikely to give you any power." "All engineers are interested in materials, and we as much as anyone else. Fortunately, most of the things you have here are either specifically banned or their use is limited in the rules for Indy cars. I guess it's still worth saying that, in modern race engines, the most important materials are still high-strength alloy steels and world-class aluminum castings. There are other materials in there and you try to optimize the materials you use with heat treatments and surface treatments, but the real building blocks of the engines are still relatively traditional materials." RW: "That's true. I'm not sure of the history, but maybe 15 years ago or so we decided that we should have our own foundry because of the difficulties you have in getting aluminum castings of good dimensional accuracy and good structural integrity. Bottom line now is we have our own foundry with our own unique process that achieves this by a quite novel means. "The basic difference is that instead of taking molten aluminum from a vat and ladling it into molds, the stuff is pumped out of the vat so you don't have a ladle passing through the scum on the top of the vat or disturbing the stuff on the bottom. You take pure, clean, molten aluminum from the center of the vat and pump it through ceramic pipe with a type of pump that has no moving parts. It's an electro-magnetic device of the type used in nuclear power stations to pump liquid sodium. "You haul this clean molten aluminum out of the middle of the vat, and you pump it into the mold from underneath. So the mold gets to vent at the top, and you don't have the gas bubbles passing up through the whole melt. It has a clear passage to the outside world. The other thing that's important is that if you maintain a modest pressure on the bottom of the mold until it's solidified, a number of things contribute to the improved integrity of the casting. First is the cleanliness of the material. Second, there is less porosity because there's a good route for the air to get out of the mold, and the pressure helps too. There's another important difference in the process, and that is the sand used in the mold is not the same stuff that's used in a typical molding application, which is usually silicon sand. We use zircon sand. The key feature of zircon sand is that it doesn't have a phase shift close to the temperature where aluminum melts, whereas silica sand does have this phase shift. What happens when silica sand undergoes this phase shift is there is a small volume change which results in a dimensional change to the casting. Fundamentally, the zircon sand gives you a casting which has better dimensional control. The stuff is damned expensive, and the only way you can do it is by recycling the sand. Another part of the process is a novel way of reusing the zircon sand so it's viable. I'm not an expert on the casting process and that's about all I can remember. "Our basic materials are high-strength steels, good castings, and optimizing surface treatments. We use nitriding on crankshafts, tufftriding on cams and tappets, and plating or vapor deposition processes on titanium pieces. "Titanium is an interesting material because it's light and very strong. Typically it has yield strengths as good as a reasonable piece of steel. It has several important disadvantages compared to steel, though. First of all, it has terrible properties when any sort of sliding friction is involved. Anytime a titanium piece has to rub against anything else it's bad news. This means that almost any application you can think of for titanium involves a part that's moving, because it's used so you can reduce the reciprocating mass of something. So anywhere you use titanium there has to be a coating." PH: "You're doing some chemical vapor deposition of materials on titanium to solve this problem?" RW: "Yes, but most of that is proprietary to a subcontractor. Wherever you have titanium you have to do something to the surface. We've been involved in research to try to improve the surface properties of titanium, but in our engine there's not a single component in the engine that doesn't have some sort of surface treatment on it. And I can't think of a titanium component in anyone else's engine I've ever seen that has been untreated either. Even if it's only anodizing, or sometimes you have to apply a clever surface treatment to the other piece. One example is titanium fasteners. You'll typically use an anodized surface on the titanium and a silver-plated nut for the female thread. Titanium fasteners are not allowed on Indy cars, but if they were that's what we'd have to do. I think I'm right in saying that, in Indy cars, titanium is only allowed for valves and reciprocating parts in the valve gear. Con rods are specifically excluded. Fasteners are specifically excluded. Likewise carbon fiber and ceramics." PH: "Just a speculation, is anybody using carbon fiber rods now? In F1, for instance." RW: "I can't imagine anybody who builds racing engines in the fashion that we do, using them. The Mugens, Ilmors, Judds, although I have no idea in truth, but I don't see them being able to do that sort of work. Typically nobody has the resources to devote to high-level research of that type. We'd like to make use of novel materials as soon as humanly possible once they've become established and proven technology." PH: "So this is probably a much more conservative business than you would think if you believed everything you read." RW: "There's certainly some truth in that. It's conservative in terms of the materials we use, but the design and the detail design is very adventurous. The performance we achieve is very adventurous despite these largely tried and tested, proven materials." PH: "I was surprised to hear Eddie Cheever commenting on ESPN's F1 broadcast speculating that the Renault engine might be putting out 100 hp more than the other engines. One percent seems a lot to me." RW: "It's very difficult to speculate on that, but I would have thought that, for one engine to be more than 3% or 4% up on another engine, is a real big step. Well, let me see, 1% is 7 horsepower so I guess you could be 5% ahead....or behind [laughs]. Depending on your point of view. Yeah, you could be 5% behind in terms of raw horsepower. You're unlikely to be 5% behind in terms of BMEP [Brake Mean Effective Pressure]. The combination of BMEP and the speed you can run the thing, and you might end up being 5% ahead or behind. [Rob looked down again to the question list.] "How are fuel mileage gains being made? Essentially the same mechanism as for power. It's a matter of optimization. You've perhaps got quite a long way to go in a methanol engine, because you're starting from a position of less knowledge. You're starting with a fuel that's less well understood. You're starting with a fuel that has many endearing properties, but burning well isn't one of them [grins]. I think where we are right now, we run methanol engines far richer compared to gasoline engines of similar technology. Some of this is linked to other elements in the rules package, no intercooler, for example. I think it's fair to say that, certainly in the past, everybody would run rich in order to preserve pistons. "One of the things that has happened recently is that, generally, people are running engines a little bit leaner and there are mileage benefits as a result of this. At the moment, very much without exception, the only way of increasing the efficiency of the engine or reducing its specific fuel consumption is by running it lean. None of the other measures that are taken by teams at the track successfully improve the efficiency. People who short-shift in order to get mileage or people who are altering their driving style may be achieving better miles per gallon, but they're not doing anything to improve the efficiency of the engine. There are still measures we can take to improve the efficiency of the engine which, of course, is reducing its specific fuel consumption. "The next question, I think, is linked to the above. What would multiple injection nozzles accomplish? Essentially it's a question of mixture preparation. Particularly in Indy car engines, where the amount of fuel you put into the engine is horrific. With the type of speeds you do around the Speedway, then you're using something of the order of 2 gallons a minute of fuel. You can figure that easily by looking at the lap times and how often the pits stops are. That's perhaps the rate at which a bucket would fill from an ordinary water tap. It's a lot of fuel, and passing it through a bunch of nozzles and trying to prepare it for combustion, trying to get it into a highly divided mist, it's better to pass it through a bunch of little nozzles than trying to get it all through one big nozzle [laughs]. It's pretty straightforward. The best you'll get through a big nozzle is a jet, but you want a fine spray. "And then the position of the nozzles is the same thing, trying to prepare the mixture the best possible way. Less fundamentally, but of equal practical importance, is that you tend to use proprietary pieces for the injectors on the engine and, at the type of flow rates that we use on the engine, there's a very limited number of parts to choose from. Unless you're fortunate enough to have an injector manufacturer in the palm of your hand, you probably need to use something that's already in existence. It may well be that this forces you, in an Indy car engine, to use two injectors per cylinder even if you wanted to use just one. As it happens, every single Indy engine in the last five years has two injectors per cylinder. The DFX did, the Chevy A did, the Porsche did, Alfa did, our engine does. "The other thing that it can do for you is give you the opportunity to improve the accuracy of the fuel at part throttle, because you have the opportunity to use only one injector at very low load. Clearly, if you have this huge fuel flow going through the engine at full throttle, then at idle you have more or less no fuel going through the engine, so you have to have a solenoid device which can turn itself on and off with sufficient accuracy to meter the fuel at both flow extremes. Having multiple nozzles gives you the opportunity to turn some of them off completely and double the flow rate through the other one that stays switched on, therefore reducing the dynamic range that the injector needs to have. That's important to fuel consumption and the accuracy of measuring fuel consumption. "Current limits in the engine? Flame travel and component fatigue strength? 'Yes' to both of those. The flame travel thing is really interesting. Obviously if you have infinite flame speed, then you could fire the engine at top dead center and would need to do no negative work. Typically you'll find that you have to fire the engine 30 or 40 degrees before top dead center, and all that time there's a flame growing and the pressure is rising in the combustion chamber at a faster rate than it would normally rise just from compression, and negative work is power that's being stolen from the engine. If you can improve the flame speed you could get a lot back. "But it's difficult to improve the flame speed and so, for most of us, it comes down to the layout for the combustion chamber and the detail design for the top of the piston and the cylinder head around the valves." PH: "I've read numbers for Formula 1 piston bores and strokes that indicate they're going to bigger and bigger piston bores and shorter strokes. Are their flame travel problems worse than yours because of this?" RW: "I think the trend toward bigger bores is being paced more by the old air consumption problem. Bigger bores definitely get more air in and then there's the reduction of mechanical loads in the con rod and big end bolts with shorter stroke. The flame speed issue would tend to push you in the opposite direction, and the fact that we're still moving toward bigger bores means that we haven't got to that limit yet. Or rather that the balance still weighs in favor of bigger bores. "It's good that you've described it as component fatigue strength rather than material fatigue strength. If you had infinite fatigue strength we could run the car infinitely fast and get more power. We can't do that because the bits break. It's important to remember, though, that most of the parts that break in fatigue break of a result of their detail design rather than for a lack of material strength. Almost every piece that suffers a fatigue failure in the engine will have some form of stress raiser on it as a consequence of the way it's designed or manufactured. You have to get rid of any of that, and the most powerful tool is detail design." PH: "When I was in college I bought a Mk. VII Jaguar sedan and drove it for several years. One day the gear shift lever came off in my hand. The break was a classic fatigue failure. The crack had been growing for years, and there was only a thin shiny line across the center where it finally broke. There was a sharp corner, no radius at all, where the threaded part on the end changed to a larger diameter. The material was strong. It was the design that was at fault. If they had put a small radius on it, it would have lasted forever. You guys must be looking at things like that trying to improve the fatigue strength of critical parts." RW: "Yeah, every piece. Even the most benign component can break as a result of a mistake or lack of attention to the design. Even in the case of the big bits that you really pay attention to, you can usually get a much bigger improvement of the life of the piece by detail design, addressing the concerns about where it's breaking, than you can from a big change in materials. There is no wonder material that can fix all our problems. "Weak components at max rpm? [Another question on my list.] Mainly valve gear pieces. It's always been the case that, sort of jockeying for position in a racing engine, you have valve gear pieces and con rod pieces, either the rod itself or the fasteners that hold it on the crank, or the piston. The layout of the current Indy car engine is such that the valve gear is the weakest link in everybody's chain. I think part of that is a result of improvements in piston design and changes in the way people have laid out their engines. Bigger bore, shorter stroke, lighter pieces have tended to reduce the loads on the bottom of the engine and refocused the attention on the top end of the engine. Particularly because of the way the rules are that exclude pneumatic valve train, solutions to this problem that have been learned elsewhere, like Formula 1, can't be applied directly. So we're still fighting a battle with Indy car engines that F1 has turned their back on for the time being. F1 is almost certainly fighting the bottom end of the engine more than the top end. "The key to the valve gear thing is understanding valve spring design and the things that upset the valve spring. It's no secret that every single valve spring is measured before assembly and it's individually shimmed as it goes into the engine, so they're very close to coil bind. They're installed in such a way that they're always a very highly stressed piece, even when the engine is just turned over at hand speed. The thing that really kills them is spring surge, which is the resonance of the valve spring under the influence of the camshaft. "There are two big elements to the design of the valve gear. One is to make sure that the cam is designed so the valve spring can keep the valve gear in contact with the cam so your reciprocating bits are in control with respect to the rotating bits. We depend on the valve springs to keep the valve in contact with the cam profile. The second and less clearly understood part is making the valve spring survive under the action of the cam irrespective of what the rest of the stuff is doing. You require that the valve spring can conform to what the cam is making it do. If you can imagine the spring in between two surfaces both moving backwards and forwards [Rob uses his hands to illustrate], the spring has to accommodate that movement without getting excited. Typically the spring will resonate, and that's when you get valve gear problems. That's the limit that wire springs still face. It's possible that another way to understand and improve valve gear design will allow us to move valve gear back down to second or third place on the list. Then we'll be limited by con rods or pistons again." PH: "So when incremental developments improve something, it just shifts the emphasis to the next weakest link. You just improve yourself to a new problem." RW: "Exactly. Piston trends [the next question on the list] is a similar story. It comes down to detail design. Again, we're very fortunate at Cosworth that we have complete control over the piston. We can design and manufacture every piston for every racing engine that we build. We make our own forgings, and we completely machine them ourselves. The trends are really in detail design. The pieces are getting smaller and lighter the whole time. We're learning things about the details of the piston construction that lead to better fatigue life of the component although we use, at the moment, the same material that we have done for some time. We use a forging alloy that was developed for fighter engines during the second World War. "Although we're interested in new materials, we haven't yet found one that has the same combination of properties as the one we're using today. In the piston you're looking for a material that combines light weight, high strength, and good fatigue properties, particularly at elevated temperatures. It has to be hot all over, but it's also got to cope with a big temperature distribution. You've probably got 300 or 400 degrees on the piston crown; that's degrees Celsius [400 degrees C is about 750 degrees F], and 150 degrees C [300 F] on the piston skirt. The thing has to be able to cope with rapidly fluctuating changes in temperature. The temperature on the inlet stroke is obviously greatly different than the temperature on the power stroke. It's really detail design that sets a good piston apart from a bad piston. "You only have to have a look at a Periodic Table of the Elements to decide where you might get a few further improvements. You can look at the light elements up on the left-hand side and start thinking about aluminum alloys that have lithium or magnesium in them, or look at magnesium alloys. We could make pistons from some of these alloys, but I don't think we could use them seriously yet. There is potential for changes in piston material, but I don't think it's imminent. "We're looking at ways of reducing piston friction. I don't think getting rid of the piston rings is possible at the moment. Most of the work on reducing the friction is getting the skirt shaped right and using the right combination of piston rings and liner materials. Piston rings and liner materials is one place where we will confess to a bit of witchcraft. It's one of the areas of the engine where it's typical to say we're using trial and error techniques and experience rather than first principles. Finding these combinations is sometimes easy and sometimes not so easy. [Again, Rob looks at the next question on the list.] "What changes do you make to the engines to maximize performance at different tracks? In this series we try to maintain the mechanical spec of the engine as uniform as we can. We try not to have a road course spec or an oval spec. The reasons for this are mainly that nobody has enough engines to be able to manage that type of approach. At the moment, the character of the engine is such that the benefits of doing that would be quite small in any case. You probably wouldn't want to do it. "Typically, we would be a bit more conservative about the way we use the engine at the Speedway [Indianapolis Motor Speedway]. To go 500 miles, we run the engine a little less quickly and would pay more attention at rebuild to 500-mile race engines. These engines get more new pieces. We have a schedule of replacement, and some parts get replaced every build and others every third build or whatever. A lot of those intermittently replaced pieces are refreshed for a 500-mile race. But in terms of the performance spec of the engine, they're essentially the same for all tracks. "In terms of software changes, nothing changes. These are not usually driven by a desire to optimize performance for different tracks. They're more driven by a necessity to get the necessary mileage. Fuel consumption is incredibly important in Indy car racing. It's the thing that has the greatest bearing on how you run the race." PH: "I hate that. I think it ruins the whole thing watching those guys short shifting and waiting until after the last pit stop to start to race. Is that just the alcohol? Would that change if they used gasoline?" RW: "They could just increase the fuel allowance. That would fix the problem if you thought there was one. You wouldn't have to increase it very much. Of course it's not an issue at the Speedway. Everybody can get all they need there." PH: "Why do they limit it? I thought it was because people would dump a bunch of fuel in for the cooling effect. Is that right?" RW: "In our case, it wouldn't do much good. It's probably wrong to have a completely unlimited supply of fuel, but the balance could be shifted in favor of more." PH: "I guess if the pressure is on and you guys get the baseline fuel mileage up a little bit, then you'd have some to play with. So maybe the pressure for fuel mileage is good?" RW: "At the moment, you end up running the engines very lean compared with what they need at maximum power. The drivers don't like it. It's kind of worrying because you have to pay phenomenal attention to the accuracy of how you measure the fuel consumption as well as the amount of fuel you have to put into the engine. It's interesting. I quite like it how it is, but I've kind of gotten used to it." [Rob looks back at the list again.] "Simulation capabilities that work? Yeah, it starts pretty early on and it continues through the development of the engine. Most of the drafting for the engine, most of the layouts for the engine are done on paper, not on CAD. But some of the parts are laid out on a computer. Particularly pieces that change a lot or mechanism sorts of pieces. It can be useful to be able to plot the movement of pieces, and the computer is good at that. It doesn't come under the realm of simulation, but it gives you the data to run in other models and other programs which are simulation. I'm thinking about finite element analysis [FEA] and valve train dynamic models that we have, programs for designing camshafts and examining the influence of valve gear changes on what we do. "The finite element thing is important to us, but it would be wrong of me to paint a picture of a big finite element model of the whole engine. It's not the case. What we use finite element for is looking at the sensitivity to change of parts that we know to be critical to us. FEA is a great way of looking at fatigue-type problems. It's best suited to the type of problem that doesn't involve plastic deformation; it doesn't involve absolute failure. The type of stresses that lead to fatigue failures are pretty well modeled by even FEA programs that run on office-based personal computers rather than huge mainframe computers. So what we use them for is evaluating different types of detail design on highly stressed bits that we know by experience are prone to breaking. It sort of quantifies the seat-of-the-pants feeling that everyone has when you're putting in a fillet radius or smoothing out a change in section or any of these classic textbook problems. We all know that putting in the fillet radius will make it better. But sometimes the FEA programs are a good way of finding out how much better. And whether it's a change that's going to go far enough to fix the problem, or whether it's only going to stall the real solution while you're doing the experiment to find out. "FEA is typically done on a piece you're having a problem with or a piece you've had a problem with that you're about to redo fresh. We can see how to improve the part incrementally, quantify that increment, and estimate the cost and benefit of the change. "We have programs that can more or less design cams on their own, if you know what you want." RW: "Yeah. Not much you can say about those except if you know what you want, they work. They're always limited by the amount of understanding you had of the problem in the first place when you wrote the program. "Once you get them up and running, dyno simulations of a racetrack are very valuable. They basically come into two categories, one being performance work and the second being durability work. Performance testing of the engines goes hand in hand with having done a lot of engines for a lot of years. We know a lot about testing racing engines. Although we use typical, standard Heenan and Froude dynos, we just use the big mechanical pieces and the installation and control pieces are designed and built internally. This enables us to make pretty good performance measurements of the engine--steady state performance within 0.5%. That would be a repeatable 0.5%. It's difficult to ascribe an absolute accuracy to it. The absolute accuracy is not really that important as long as you can be honest with yourself when you analyze the results. It's not that often that something happens to change the absolute accuracy of the measurement." PH: "Are dynamometers accurate one to another? Is there variation from one piece of equipment to another?" RW: "They should be very close." PH: "That same 0.5% number?" RW: "Maybe 1%. There's a lot more difference in test results coming about from dishonesty or different corrections than there is in actual changes in the measured performance of the engine." PH: "Are all power measurements corrected to standard atmospheric conditions?" RW: "Yeah. You can get quite big changes if you change what you ascribe to be standard, though. We correct our numbers to 25 degrees C and 66% relative humidity and 45 inches of mercury, which is the nominal boost allowed in the rules. We'll adjust the waste gate so the absolute boost is 45 inches each time and correct the observed power according to the condition of the inlet air." PH: "In an engine on a track, how close does the boost get to the allowed 45 inches of mercury? How much of the time does the engine run close to the max boost?" RW: "It depends on the type of track. It's everybody's goal to have the engine at 45 inches of mercury the whole time the driver has his foot to the boards. The whole time the engine's at full throttle, it should be running at 45 inches." PH: "I guess I don't know how that's controlled." RW: "There's a pop-off valve that's supplied by CART. That has no influence on boost control. It's the penalty for screwing up the boost control. The rules say we use waste gates that are controlled by the plenum pressure. Essentially, the current arrangement for all the cars that race is that there are two waste gates. The waste gate is a device that measures the boost pressure in the plenum and, according to that pressure, it either spills exhaust gas bypassing the turbo or it forces exhaust gas to go through the turbo. Basically, if the waste gates are open, then there is a direct passage out to atmosphere for the exhaust gases. If the waste gates are shut, the exhaust has to go through the turbo and the turbo will be increasing the pressure in the plenum. When the waste gates are open the turbo will be slowing down and the pressure in the plenum falls. "Effectively, you match waste gate performance to engine performance using a spring. It can be open or shut or anything in between. Typically, around a superspeedway, the plenum will be at 45 inches all the time. Around a short oval the plenum will be at 45 inches the whole time the driver is on the throttle. He will lift briefly in the corners, but the boost doesn't fall sufficiently far that there is a significant response time when he gets back on the throttle. It's instantly back at 45 inches. On street courses and road courses it's a bit more difficult. There's substantial part-throttle content at a road course. You wouldn't want it to get to 45 inches during the time the driver is at part throttle. At part throttle the turbo slows down and cools down, and when the driver goes back to full throttle there's a response delay before you achieve full boost." PH: "I hear the drivers blipping the throttle in slow corners. I assume that's to keep the turbocharger spinning?" RW: "Yeah. There'll be some of that taking place with changing gears and making the car change direction, which some of them don't want to do this year [smile]. "Boost control is a subject all to itself. It's a big part of making the engine work in the car. "Going back to the dyno, the important thing is the dyno measures the steady-state performance of the engine. It doesn't measure the performance as the driver nails the throttle coming out of a turn. That'll be related to the boost control. There are a number of ways of going after this. We have a performance development dyno in England that's capable of measuring the transient performance of the engine in addition to steady-state performance. There's a big flywheel mounted on the back of the dyno. It sounds simple and looks very scary, with big pieces of metal rotating at engine speed. It's got big railway engine-type disc brakes on it to slow it down. But what it enables you to do is add the inertial load to the hydraulic load on the dyno so you can examine the performance of the engine with realistic rates of change of engine speed which you cannot normally do. Transient testing on a dyno is useful for performance work and durability work. "The nature of superspeedways is such that you can do a very good simulation with just a regular dyno control. You have to be able to run an engine flat out for a number of hours." PH: "That'd be scary too." RW: "You've got to do it. [Laughs with pained expression.] We've learned a lot doing that; bolting the engine down and power testing it in the normal fashion and then doing a superspeedway simulation. You can choose the range of engine speed and cycle it up and down at full throttle. If you have something you're particularly worried about you might have to stop prematurely, but we have one engine which for the last two and a half years has been continuously built and run in this endurance cycle and then rebuilt. This is to find which pieces break." PH: "So you've got a continuous durability program?" RW: "It's about the only thing you can do to be able to go into one of these big 500-mile races with the belief that you can finish the race. Sometimes you can have that belief and it still doesn't happen. "Going back to the questions. If you have the opportunity to influence chassis design, what do you do? The main thing here is making sure the bits that affect the engine work. There's a divided responsibility in putting an Indy car together. Our biggest interest when the chassis is being built is in making sure the systems that interact with the engine do what they have to do without causing performance or durability problems. What we're thinking about here are big mechanical bits. We want to see that the engine mounts are sensible so that the mechanical loads from the car that need to be carried by the engine are being put into the engine in a sensible fashion. And we need to see that all the plumbing is as it needs to be, in particular the oil tanks and the breather systems. They're crucial to making the engine last. "I guess it's not immediately obvious to someone watching the race on TV that if you're pulling 4 Gs around a turn at a short oval, then the oil that would normally be sitting on the bottom of the tank will be sort of splurged up the side of the tank at an angle of about [Rob pulls out his pocket calculator again.] 75 degrees or something, making it very difficult for the oil tank to cope with the oil being settled on the bottom at one point in the lap and up the side at another. Of course on a road course it can slosh to the other side on another part of a lap. Getting an oil system that works reliably is real important to us all [Rob grins]. "Car designers have these things in their minds but there's other things in their minds as well. Like aerodynamics, they've got packaging goals. They want everything tiny, tiny, tiny. They want it to sit low down. Sometimes these things come into conflict. The engine people just want their engine to live [laughs]. You have to pay attention to a new car when you first test it. If you have a new car and the oil tank doesn't work, you blow some engines up." PH: "I guess the clutch and gearbox comes in there too." RW: "The transmission and the way the transmission is attached to the car is not often open to us to have a big influence. In the case with a car that's being laid out and there's fairly close cooperation with the engine manufacturer, then there will be dialog. If there's anything that strongly offends the engine guy, then he's going to tell the car guy what's going to happen because he's interested in the car doing well. "The other things that are important to us are exhaust layouts and installation and turbo position and installation. The turbo position determines what the exhaust pipe ducting looks like and what the ducting from the outside world into the compressor looks like, and the compressor up to the plenum. All of these factors can affect the performance of the engine so we like to know what's happening there early in the proceedings so we can make changes. "Likewise the boost control system is an important part of getting the car performance sorted. We like to do more than influence the design of the boost control; we like to control it. We make the waste gates, and we make the boost controller. Although in the past this has been the car builder's territory, we build them. It's one of the things we do to reduce the amount of grief we get at the racetrack. Historically, the boost control has been a gray area, a bit of divided responsibility. The pieces previously would have come with the car, but now they bear more on the engine performance than car performance. The engine person is more likely to understand these pieces than the chassis guy. "Trends in packaging? [Next question on the list.] The trend in racing the world over is toward smaller, lighter pieces, and to engines that are more greatly integrated with the chassis design. That's become more and more important." PH: "More integrated in both structure and aerodynamics?" RW: "Exactly. Specifically, engines have got narrower, particularly in the sump area, under pressure from car designers to give them more space for the diffusers underneath the car. That wouldn't apply to an Indy car because the underside is controlled, but it would apply to a Formula 1 car. Engines have got narrower and could get lower. A recent rule change in Indy cars has perhaps taken some impetus out of repackaging engines, but I don't think they can completely detune us. A new rule controls the shape of the engine covers and is set up around the existing dimension of the Cosworth XB engine. "The packaging thing is interesting. There's no doubt that if a car designer could convince the engine people of a needed change it would get done, but not if it affected engine performance. You'd only make a change that didn't influence the power because the aerodynamic things can't be measured with the same precision you can measure engine performance, so it would be a fairly risky activity to give away some engine performance in exchange for an aerodynamic hypothesis." PH: "That's a very interesting point. So the package is important, but you would never sacrifice engine power." RW: "You'd never give up horsepower. When it comes to horsepower, more is definitely better than less. "The other thing that's increasingly important to the car people is the cleanliness of the engine. It's becoming the case that they want fewer components external to the engine. So the auxiliary things which used to sprout from engines, things like fuel pumps and alternators that used to be external pieces, are now more integral with the engine. The fuel pump is another example of a chassis bit which has always been built by the engine manufacturer. You can see that engines of today have a much cleaner appearance than engines of 10 or 15 years ago. You can't see through them any more. The space in the valley between the banks is better occupied and there are fewer and fewer external parts. [Rob again refers to my list of questions.] "The most critical piece to design and develop? Probably all of them [laughs]. It goes, really, back to the bits that are the weakest link. So that it comes down again to the valve gear. The big mechanical bits that people think about when they think about engines are the most difficult to design. The valve gear, the cylinder heads, the block, the crankshaft, the rods, and the piston. The bits that are relatively easy to design and develop are the ancillaries, the pumps and the bolt-on bits on the top. The inlet arrangement might be quite hard, but the design is relatively straightforward. You just do it." PH: "What do you do on a race weekend? At the Indy car race at Vancouver, Ian said I should try to catch you Saturday afternoon because you might have some time to talk. I hung around, and I watched you in one of the team areas sitting on an electric cart, and there were never less than three or four people there talking to you. What do you do there?" RW: "It's incredibly difficult to explain sensibly. [Rob shakes his head and we both laugh.] I cannot give an adequate answer to this question no matter how many people ask me, whether it be socially or at work. I have to try to describe what happens at a typical race weekend, and that's very hard. "Essentially, I'm there to take care of the engines. I'm there to do all of the things that you've suggested in the question here, to give technical support, to be a sympathetic ear, and to communicate with the customer. But the balance or the level of dominance of each of those things varies according to circumstance. Being relatively fortunate this year that the engine has been, on the whole, reliable; we haven't had too many repetitive problems. We haven't had too many common threads running through. "A big part of my job is to be there to gather information about problems or failures--as early as possible. And try and get information from the teams while it's fresh in everybody's mind and while they're wanting to talk about it. If you don't get the information right away, then it's often lost for all time. "It's kind of difficult to know how to support the engine in service. We try to maintain very close links between the customers who use the engine and Cosworth, who builds and services the engine. We want to make sure that there's always a channel for communication in both directions just to make sure that if anyone has a problem at a race weekend that they won't think that it's being glossed over. We want them to have confidence that we know about it, for starters, and we want them to have confidence that once we find out about it we're going to get someone to try and fix it. So a big part of my job is information gathering, particularly on problems that exist. If we go to a race weekend and we experience engine failure, then I like to be in there as soon as possible after the fact to try and establish exactly what went wrong. "Some of the tools that you have in your armory here are the diagnostic equipment that's carried on the engine itself. The ECU [engine control unit] that controls the engine has some diagnostic capability. All of our customers use very good proprietary data logging equipment and we have access to that in order to diagnose what went wrong if there's a failure--temperatures and pressures and the exact sequence in which the traces changed during a failure. "The failure analysis is important because it enables people to continue through the weekend with some knowledge of what happened rather than continuing in ignorance. If you have to take an engine out of a car, it's good to know if there's a chance of a similar failure with the engine you're about to put in or if it's a random thing that's not likely to recur or if it's a mistake that's happened, which means that it's almost certain not to recur. "There are times at some of the racetracks where you can influence the performance of the car, where you can work with the customers, making just small changes to things. You're never going to reinvent the wheel on a race weekend, but you can get a little further down the optimization road. You can maybe do something to some elements of the mapping of the engine to contribute to drivability concerns. You can maybe do a small experiment looking for fuel mileage gains. You can't really do any experiment that has a lot of risk attached to it. If you judge the change carefully, then you can go in with an experiment that might get you something back on drivability or fuel mileage or something like that. "There's a lot of learning to be done about the car systems that we mentioned earlier. The only real experience that we gain, the real-life performance of oil tanks and waste gates and turbochargers, is during race weekends. For all the work you can do back at the factory on dynos and stuff, you just can't cover the same amount of ground that even one or two cars can cover in a race weekend. Learning the character of these subsystems is very important. "It's important to keep the customers up to date with what's going on back here, to relay to them the status of any engines they have in work here at the shop, to keep them abreast of any changes in the performance spec of their engine. It's the nature of racing engines that the spec changes quite rapidly. It's a bit of a juggling act. Inevitably you end up releasing parts still with some degree of risk attached to them. So there's an unfolding story really, as you learn about the engines you have in service. "If you judge it right, what happens is you introduce a change in spec and you try to go in very conservatively. So, shortly after you've changed the spec of the pieces, you can turn the wick up the whole way. When you introduce new pieces, you'd like to think you don't go whole hog when there's still some risk attached to them. For example, you might choose not to run a big rev limiter when you have some new pieces in the valve gear or something like that. Then later on you might learn that all looks good in the engines that you have out in service at the lower limiter, so you can maybe go to the limiter that you thought you should have had all along. "Alternatively, you might have made a mistake; you might have not been conservative enough. As a result of running some engines with some new pieces in, you might have to do some swift reactionary stuff in order to stop the thing growing into a crisis. It's important to communicate that sort of information as well as gather it. It's got to come back in from the team on one hand, but you've got to be sure you're giving feedback on the other hand or the sources of information will dry up. "It's particularly the case in Indy cars that even the biggest teams don't employ engine specialists. So you need to be there in order to advise and comfort and just to see that they don't do something inadvertently that will upset the engine." PH: "That's a big point that's new to me. I didn't know that the teams don't have an engine guy. That's changed. Twenty years ago all they really knew to fiddle with was the engine. They didn't know what the shocks did and not much about the suspension. The engine, now, is a black box that they plug in and out and they don't want it to break and they expect increases in power and they expect someone like you to be right there to make sure all that happens. That's an amazing change in some of the racing series in the United States. Is it the same in Formula 1?" RW: "Not to the same extent. In Indy cars, Cosworth has one technician with each team, the exception being our two lead teams, Newman-Haas and Ganassi, who have one technician per car. During the race weekend they report to me. They look over each engine every time it goes in the car. They make sure there's no obvious problems. They're there to work closely with the team. They're the primary contact for educating the guys on the team who are maybe dressing the engines. They would deal with most of the mechanical things that would crop up on the engines. The background of these people is that, typically, they've been engine builders. They will also prepare the electronics on the engine for use on the track. "There are several different features that need to be programmed into the engine, into the ECU. They take care of all that and they will liase with the engineer on the team and decide how lean they're going to run the engine depending on where they are on the weekend. They just check that the car systems are as they should be, and they encourage the teams to pay attention as well. They sort of poke and prod around and ask questions about how much oil the thing's using, and keep abreast of the temperatures the thing runs at. They've only got two feet and they can only get around so far, but the basic idea is they try to maintain an awareness of the needs of the engine. If there's a problem or crisis, then I get wheeled in to find out what's going on. "It's very difficult to make sense of. Some weekends you'll find yourself lying on your back under a racecar looking at a hole in the side of an engine. Thankfully that doesn't happen very often. Other times you'll be taking somebody's turbocharger or waste gate apart and putting it back together, or maybe you'll spend hours giving yourself a headache over a set of data logger results trying to understand why it's different from the last time at this place or trying to achieve some incremental improvement in some feature like the boost response or something like that. Very, very diverse. The problems of each track are very different. Some places you'll be scratching around the whole weekend looking for how you're going to make it round the track on the necessary fuel allocation. The whole thing is very difficult to describe." PH: "What parts of your job do you like the most and least? Do you like the race weekends?" RW: "I like the uncertainty of it. I like the fact that you don't know going in what a weekend's going to hold in store for you. I like the fact that, by our responding quickly to problems, then you can make life better for a lot of people. It forces you to think on your feet. It forces you to assimilate facts very quickly. Hopefully, you don't make too many mistakes. If you react to a problem that you've discovered and you get a fix in place, then you can maybe stop some people from falling out of a race and save some people some money at rebuild. Even if it isn't that clear cut or even if the news isn't good, sometimes you can tell a team they have to change an engine early on and they get it done sooner and they go to dinner earlier. "The thing I don't like about it? I don't like the feeling of impotence you sometimes have. The feeling you have that the die is cast and you're powerless to do anything about it. I guess the best example of that was during 1992, when we had that auxiliary drive belt problem. We thought we didn't know how to fix it but we knew that until we did fix it we were certain to experience failures. That's a terrible feeling. "But, likewise, unless you understand the thing, you can't fix it. You have to focus on understanding the thing rather than making up a random change. You couldn't hope it would go away. Although we didn't understand the problem we knew it was something to do with the car and it turns out it probably was, but we still needed to make the engine resilient to this and the change we ended up making was huge. It involved a new front on all our engines. It made half our parts list obsolete overnight. It was a big change and certainly not a change we could entertain without making sure we grasped what was taking place." PH: "When did you join Cosworth?" PH: "How much longer will you be in the United States.?" RW: "I'm still not sure what I'll do next year. I'm not going to England right after the last race. I'll be here till Christmas time. I'm interested to see what happens the next few months. We'll be testing a new car, the Reynard. Once it gets back over here we'll find out if it's a sinker or a swimmer. The contents of this web site are copyrighted by Paul Haney. No reproduction of any component allowed other than for your own personal use unless full source attribution is quoted. All Rights reserved by Paul Haney, 1999, 2006.